Despite the ongoing existential threats from the likes of Argentina, Ecuador and Brussels, George Osborne's little orange fag is to hand in an essay next month on the subject of what, if anything, might replace our American nuclear deterrent. It was Trident, you will recall, which did such a wonderful job protecting us from Islamist terrorism and which memorably kept us from being forty-five minutes from doom at the hairy hands of Saddam Hussein. Back when they still showed some token interest in liberalism and democracy, the Liberal Democrats were more or less against a like-for-like replacement; however, as might be expected, the essay comes to no conclusions and is likely to argue that Britain can best support disarmament by remaining sufficiently armed to sustain the wog-bombing at something like present levels. This will save Britain's Head Boy the minor inconvenience of ignoring yet another piece of paper, and will save the Deputy Conservatives the all-too-familiar experience of having their collective head inserted down the Bullingdon Club's private lavatory. A very long time ago now, I saw a film on late-night television, about the last survivor of a global biological war. Empty cities full of skeletal corpses were not quite the cliché they have become amid the present banalisation of Armageddon; and I was much impressed. The ending was also much more downbeat than I was used to at the time, although it was positively saccharine compared with the savage irony of the source novel. The film was called The Omega Man, and the source novel was Richard Matheson's I Am Legend. Of course I had to have it; but the internet was some decades away, and I had to make do with haunting second-hand stalls at Preston market. It was there that, before the prize came my way, I discovered several Matheson story collections. I think the first I found was Shock 3, wherein I was shocked to discover a number of stories which were not shocking at all. Most of them, I realised as I accumulated more books, were something rather better. Matheson was a pioneer of science fiction that focused on ordinary lives rather than on superheroes and spacemen: "The Test" is a poignant tale about the emotional cost of ageing and of one possible solution to the problem; "Steel", about a future in which the sport of boxing has been roboticised, focuses on a couple of down-at-heel losers hauling an outdated model around the country in the deluded hope that good old-fashioned machinery will get them their big break. In "Full Circle" a reporter decides to expose his society's mistreatment of an ethnic minority, with results that haven't dated a bit. Matheson varied his style with great virtuosity to suit whatever material he was writing. He was a craftsmanlike and commercially successful screenwriter, and his fiction has the good old-fashioned screenwriter's virtues of clarity and concision; but his stories and novels never read as though they are mere anticipations of movie contracts or excuses for upcoming TV episodes. He pared his prose to the bone in "Blood Son", the stark and blackly funny story of a boy who wants to be a vampire; he inflated it ludicrously for comic tales like "'Tis the Season to be Jelly", about decrepit mutant hillbillies in a disintegrating world; and "The Doll That Does Everything", in which an artistically inclined couple find a modern and convenient way to quiet their disruptive offspring. "Witch War" and "Dance of the Dead" which, like I Am Legend, apply traditional terrors to future-war scenarios, are intense, imagistic, gruesome and sardonic. He wrote tales of paranoiac horror featuring amnesiacs ("The Curious Child", a riveting story marred only by an unconvincing resolution) and disappearances ("Disappearing Act", which is all the better for having no real resolution at all). "The Distributor" is an ambiguous and thoroughly disturbing tale about the destruction of a neighbourhood; Ramsey Campbell's "A Street Was Chosen" uses the same premise, but the horror in Campbell's story is impersonal and bureaucratic, while that in Matheson's is personal and vengeful. He wrote about the end of the world, with ordinary families ("Descent" and "The Last Day", both convincingly bleak) and demented sole survivors (notably a pulp science fiction writer in "Pattern for Survival"). He wrote some of the most poignant genre love stories outside the work of Theodore Sturgeon; he also wrote "Lover When You're Near Me", a superb and repulsive tale of sexual obsession. Bid Time Return concerns a man who falls for a Victorian actress and wills himself back in time to be with her; it was filmed, rather well, as Somewhere in Time. "Return", an earlier story about a time-travelling scientist, gains emotional power because of the protagonist's doomed love for his wife. Matheson stated in the introduction to What Dreams May Come that its depiction of the afterlife was factual in every respect save that of the characters and their relationships; whatever one may think of that (and I'm not sure I was terribly convinced even as a teenager), the characters and their relationships are sufficiently well depicted to make the book a touching supernatural adventure story. The nature of the afterlife is also a theme of Hell House, in which scientific and spiritual points of view come into conflict during an investigation of a notoriously haunted mansion. The film adaptation, The Legend of Hell House, lacks the book's explicit sexuality, but retains its convincing characters, gloomy atmospherics and clever resolution. Matheson is justly renowned for his work in the horror, science fiction and suspense fields (and for his lack of scruple about genre boundaries); but he was clearly never a man to dig a rut and stay there. Among the aforementioned comic tales is "The Splendid Source", a mock detective story about a rich young eccentric who becomes obsessed with discovering the origin of off-colour jokes. The Beardless Warriors is a Second World War novel about teenage soldiers, depicting a week of intense combat both on the battlefield and inside its unhappy hero. Now You See It, aptly dedicated to Robert Bloch, is a demented locked-room mystery set in the home of a second-generation stage magician and narrated with black wit and considerable relish by a paralysed stroke victim, "your servant, Mr Vegetable". One of the four Shock collections featured "Go West, Young Man", a Western with a non-supernatural but decidedly chilling twist. During the 1990s Matheson turned to writing Western novels, and produced Journal of the Gun Years and The Memoirs of Wild Bill Hickock, revisionist demolitions of the gunfighter-hero myth; The Gunfight, an archetypal tragedy of masculine pride, social nastiness and family values; and Shadow on the Sun, about an Indian agent who comes up against the supernatural. I could go on and on. There can be few writers of any stripe who have done so many different things so well. The director of Human Rights Watch, who apparently has been living in blessed ignorance of the doings of New Labour, Chris Graybeing and Theresa May, has urged Britain's Head Boy to do something about, of all things, human rights in Kazakhstan. The former Soviet republic has some oil reserves, but these will be of little concern to the bloke in charge of the greenest government ever, particularly when ethical matters such as business deals are involved. Nevertheless, Daveybloke is toddling off on a sales trip to a country in which Human Rights Watch has documented "credible allegations of torture, the imprisonment of government critics, tight controls over the media and freedom of expression and association, limits in religious freedom, and continuing violation of workers' rights". It is possible that Daveybloke may take exception to controls over the media which are not exerted by his chums at News International; but since the rest amounts to little more than a wish list for the British Home Office, he may experience some difficulty in persuading the Kazakhstan government of any moral concerns he may have. At last he's gone, and given us some room. Covert now, but for when it wins a vote. And help them kill each other in his name. Daveybloke has been having a bit of a burble about the claims of attempts by the police to mount a taxpayer-funded smear campaign against the Lawrence family. Stephen Lawrence's mother has been making rather a nuisance of herself, writing letters to Daveybloke and his little orange fag and attempting to undermine confidence in the Osborne economic miracle. Quite apart from wishing to save himself the trouble of setting up another Leveson and then ignoring its findings, Daveybloke is no doubt anxious to remind the lady of her proper place. Accordingly, Daveybloke burbled that nothing is off the table at the moment, before burbling that an independent public inquiry is off the table for the moment. Instead, Daveybloke's mad old cat lady and civil liberties champion Theresa May has been dispatched with a note to Mark Ellison QC, who is investigating the original Lawrence murder investigation. Ellison has been told to look into allegations that the Metropolitan Firearms and Headbangers' Club bugged its meetings with the victim's friend Duwayne Brooks and his lawyer. In case Ellison should turn out insufficiently rigorous, Daveybloke has also asked the Metropolitan Firearms and Headbangers' Club to investigate itself which, as it so often does, should help clear things up in short order. Meanwhile Jack Straw, the well-known enthusiast of truth, justice, kidnap and torture, has said that he will help out by referring the allegations about the smear campaign to the Independent Police Complaints Commission. Well, with Jack Straw and the IPCC on the case, who on earth needs an independent inquiry? Straw was also considerate enough to deny all knowledge of an undercover dirty-tricks unit being deployed against the Lawrences, just in case anyone might happen to wonder. Attentive readers may have observed my occasional efforts to live up to Michael Gove's vision of history by marking the anniversaries of certain great British achievements. 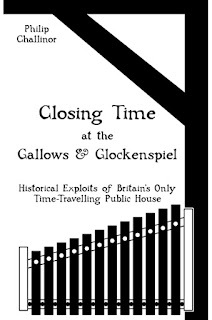 I have been aided in this enterprise by a handy list of dates and of course by Wikipedia; but most of all by the voyagings of the Gallows and Glockenspiel, Britain's only known time-travelling pub, and by the doings and observations of its erudite regulars and imperturbable barman. This humble offering, containing all the twenty-two dispatches so far published plus nineteen more, will hopefully be available as paperback and ebook before the elapse of many more chapters of our glorious island story. Be A Statesman and Come Along! Well, here's a thing: the Serious and Organised Crime Agency has been accused of withholding evidence on the criminal activities of large British corporations. Insurance firms, telecom companies, legal firms and individual wealth creators all paid private investigators to hack computers and steal information; SOCA compiled a report which was submitted to the Leveson inquiry, but apparently decided that its responsibilities ended there. Nobody was arrested, nobody was prosecuted, the criminal activities apparently continued, and the Commons select committee on home affairs was not informed of the report. Assuming it's all true, no doubt SOCA was merely being tactful; since the large British corporations which own many Members of Parliament may soon own SOCA as well, unless larger foreign corporations can be found to take on the burden. Daveybloke's flexible fag, the faithful little chap who signed up to the Osborne economic miracle, who drove a coach and horses through the coalition agreement in order to privatise the NHS, and who once promised the greatest programme of parliamentary reform since 1832, has been lecturing the remains of his party on realism. Wee Nicky wants the fragments to become a "fully-fledged party of government"; in Standard English, he wants them to stop being Deputy Conservatives and become real ones, like New Labour. Wee Nicky "acknowledged the Lib Dems had taken a hit following the decision to enter coalition with the Conservatives in 2010". Most of us were under the impression that the Lib Dems took their various hits following their various decisions not to compromise with the Real Conservatives but to adopt wholesale the Real Conservatives' swivel-eyed programme of pilferings and persecutions after barely token resistance; so it is jolly nice of Wee Nicky to set the record straight. Wee Nicky warned that irrelevance, impotence and slow decline holding the comfort blanket of opposition would be a good deal worse than irrelevance, impotence and rapid annihilation cuddling the red box of ministerial office. Accordingly, Wee Nicky has commissioned his chum David Laws to draw up a severely pragmatic new manifesto, "a to-do list, not a flight of fancy", spelling out the party's red lines for any coalition negotiations, whether with the Real Conservatives, Labour or UKIP. True, there is some time to go before the election; but it is no doubt just as well to get the sour laughter out of the way before starting the inevitable process of turning the red lines orange and then painting them out altogether. The Minister for Health and News Corporation, Jeremy C Hunt, has been wagging the finger at the Care Quality Commission. Certain isolated and sporadic persons at the CQC have allegedly been behaving in a manner more suited to newspaper moguls and cabinet ministers, which undermines "the millions of doctors and nurses who do an amazing job, day in, day out" and whom the Government hopes soon to efficientise out or else sell off to private companies. Hunt gave the NHS a sanctimonious little pat on the head for changing its ways after many years of cover-ups and, presumably, a Duncan Smith approach to statistics. "There has to be accountability within the NHS for people's actions when something goes wrong," Hunt sermonised, and threatened "very, very serious consequences" should the allegations of misconduct be proved and should those responsible turn out to have no special advisers to sack in their place. The Christian state of Texas is approaching a glorious anniversary: the execution of one Kimberly McCarthy, scheduled for next Wednesday, will bring the state's bag to a respectable five hundred since the reinstatement of the death penalty in 1976. McCarthy is black, as these trophies of justice so often are, and her lawyers are trying to use this in obtaining a stay of execution, on the blatantly racist grounds that there were too many white folks on the jury. The filing cites some delightful examples of Texan political correctness, including a 1963 training manual advising prosecutors against allowing "Jews, negroes, dagos, Mexicans, or a member of any minority race on a jury, no matter how rich or how well educated". Another manual of more recent vintage advised that it is "not advisable to select potential jurors with multiple gold chains around their necks or those who appear to be 'free thinkers'", and three years after McCarthy's own conviction the Dallas Morning News discovered that prosecutors were excluding black people from juries at more than twice the rate for white people. McCarthy's lawyer has even asked two judges to recuse themselves from the case on the grounds that they served as assistant district attorneys in the office where the discriminatory selection is supposed to have taken place, and has raised questions about the quality of legal representation which McCarthy received. All in all, it looks as if simply killing off one more black prisoner would take up a lot less time, trouble and paperwork. Royal Mail workers, who doubtless know as little about what's good for them as medical workers know about patient care, have voted against privatisation of the service. More than ninety-six per cent opposed the sell-off, on a turn-out of seventy-four per cent; so in the absence of the usual excuses we can doubtless expect comparisons to Hitler's plebiscites in the near future. The Government has promised that at least ten per cent of shares in the privatised company will go to the proles, and the company has promised that terms and conditions will not be affected except when they are. Royal Mail has also proclaimed that privatisation would "combine the best of the public and private sectors", which means that public money will be used for private profit in the great public-service tradition of Network Rail, Southern Cross, G4S, Serco, ATOS Healthcare and so forth. "Our plans are not new," squealed Michael Fallon, who is something or other at the Ministry for Profiteering and apparently believes that workers tend to oppose the pilfering of the public sector out of sheer antiquarianism. Fallon pointed out that Parliament debated and backed the privatisation two years ago; and it will indeed be a sad day for democracy when some thousands of mere taxpayers can outvote the nods and winks of a few hundred time-servers, seat-warmers, chancers and show-offs in the House of Claimants. I am sure we all remember the Leveson report and its recommendation that the British press be transformed from its present raucous yet scrupulous self into a Mugabe-style organ of state propaganda. Daveybloke and his cuddly chums intervened in the name of liberty, and there the matter has rested, although the editor of the Financial Times is impatient to clear it up before September, when Daveybloke's chums from the Murdoch family will be invited to clear their names. Accordingly, Lionel Barber has come up with a spiffing new wheeze to break the deadlock between what the likes of Rupert Murdoch and Paul Dacre want and what the likes of Rupert Murdoch and Paul Dacre will settle for, and has proposed that the Government appoint a mediator to broker a deal between the press barons and their more vindictive persecutors. "You need someone who some experience of journalism, some experience of business and some political nous, and someone who is respected on all sides," Lionel Barber told the Commons committee on prolefeed. His favoured candidate, therefore, is a Conservative peer and a member of Paul Dacre's pet complaints commission; which will certainly connote the term "honest broker" in some sections of the British press even if it's a bit left-wing for the mainstream. It is a truth universally acknowledged, that a right-winger with a party full of scheming backbiters and screaming baboons, and an economic "recovery" which will most likely benefit mainly those who caused the collapse, must be in want of a war. What with the provocations of Cristina Fernández de Kirchner having fizzled out for the time being, and the SAS being apparently disinclined to storm the Ecuadorean embassy, and the Euro-wogs wearily shaking their strange foreign heads, and the most nearly Churchillian things about him being his hairline and his waistline, Britain's Head Boy is evidently becoming worried at the lack of a worthy quagmire. Accordingly, his special nuncio to Belize, Willem den Haag, has been blathering up the advantages of getting stuck into Syria. Apparently we can arm the opposition after all, with no danger of escalation, so long as the weapons are clearly marked Not For Extremist Use, because "there are a lot of good Syrians, I can assure you". Well, that's a relief. These conditions being met, the whole adventure will be just like the liberation of Libya, which had such salutary consequences for one of the Reverend Blair's more reputable chums and which had no knock-on effects at all in, for example, Mali; at least, not for anyone who mattered. In what Britain's leading liberal newspaper called a "difference of emphasis", Daveybloke and his little orange fag have agreed not to arm the rebels in Syria for the time being. Wee Nicky said Britain is a nation that wants to do things when it sees things going on, but that the things that are going on in Syria are not the sort of thing that Britain can do things about. Daveybloke burbled about providing free schools for the good guys ("the official proper Syrian opposition") and used the word actually a lot. When it comes to arming Muslim extremists, of course, Daveybloke mostly prefers selling to governments with restive populations and reliable collateral. No doubt Wee Nicky agrees with him there, with some small difference of emphasis. Now that the United States has made the apparently faith-based decision that Syria is using chemical weapons, the Ascended Incarnation of the Reverend Blair has felt free to intervene in his inevitable fashion. There is, it seems, no violence in the Middle East that cannot be resolved in tip-top fashion by greater violence from the crusader states. The poodle yapped with indignation at the idea of chemical weapons being used: "this will be the first time since Saddam used them in the 1980s" with the enthusiastic approval of Britain and the US, which themselves have resorted to depleted uranium and white phosphorous on only a few insignificant populations. His reverence is also exercised about the underhanded involvement of Iran via Hezbollah; Tony prefers people who fight cleanly and in the open, like Israel in Lebanon. His reverence recommended no-fly zones and régime change, since they worked so well in Iraq, and expressed a certain annoyance at Iran for complicating things so much, meddling where the West has intervened and destabilising what the West has kicked to bits. "It's exactly the arguments we went through over Iraq," his reverence said. Clearly, the rest of us still have much to learn. Four former Home Secretaries, including fans of torture, ID cards and three-month periods of detention without trial, have ganged up on Daveybloke's flexible fag to try and persuade him towards yet another flip-flop. A letter to the Murdoch Times urging more national security has been signed by Jack Straw, David Blunkett, Alan Johnson and the self-basting Thatcherite batrachian Kenneth Baker, and includes the delightful line: "We find it odd that many critics of the bill prefer to champion the rights of corporations over democratically accountable law enforcement agencies", which is surely on a par with George W Bush's famous gag about preserving, protecting and defending the constitution of the United States. The Deputy Conservative leader is of course notoriously susceptible to the blandishments of corrupt right-wing bullies, but it is as yet unclear whether the present charming cabal will have much of an impact. It isn't 2010 any more, and opposition to the snoopers' charter is one of only two major Liberal Democrat principles (the other being their opposition to cutting Europe off from the mainland) that remain to be sold out. According to the Government's own statistics, the first year of the Osborne economic miracle put an additional nine hundred thousand people in poverty, including three hundred thousand children from the households of working scroungers. The Government has a legal obligation to reduce child poverty to below ten per cent by 2020, and we all know how seriously the Government takes its legal obligations. Iain Duncan Smith, the well-known statistical expert, blamed the figures on inflation, which increased faster than incomes during the period in question; and of course there was no question of the Government doing anything to boost incomes except through tax cuts for wealth creators like Bob Diamond. The brilliant Duncan Smith blathered that there really isn't much of a problem: "we have successfully protected the poor from falling behind", presumably by relieving them of those nasty spare bedrooms which were weighing so many of them down. The brilliant Duncan Smith wishes to "take a new approach by finding the source of the problem and tackling that", much as the Government has found and tackled the sources of economic recession, climate change, phone hacking, corruption and so forth. Perhaps the brilliant Duncan Smith hopes, with Labour's willing abstention, to force through another retroactive law deeming the legal targets to have been met. In any case, doubtless the situation will improve yet further as the effects of the last two years of incentivisations become clear. Some brave young persons doing a wonderful job in difficult circumstances may soon be subjected to the onerous experience of having criminal charges brought against them. The Crown Prosecution Service has received a file on the Lancashire police officers who tasered a visually impaired stroke survivor last October; presumably because the victim in this case has not had the courtesy to die on the spot and thereby prove himself among the criminally inclined. Instead, he is claiming assault, false imprisonment and a breach of whatever human rights the Home Office has not yet bundled onto a plane back to Brussels. It is to be hoped that the officers involved have been given appropriate advice in polishing their notes on the incident for maximum accuracy, so that the likely non-prosecution can proceed smoothly towards the inevitable acquittal. All in all, the Government probably contains only a slightly larger proportion of thieves, fraudsters, scroungers and confidence tricksters than the House of Commons as a whole; so naturally the idea of convicted offenders having voting rights is even more nauseating to the Bullingdon Club than the idea of regular proles having any rights whatever. Two men serving life sentences are claiming, respectively, the right to be added to the electoral register and the right to vote in European elections, and Daveybloke's legal aide has been making clear to the supreme court the Government's preferences in the matter. The cases highlight "important questions as to the proper respective roles of the courts and of parliament", so naturally the Government is anxious to get them both thrown out as quickly as possible. Parliament, for its own part, is still reeling with righteous indignation at the Euro-wogs' ruling that denying all prisoners the vote is illegal; and doubtless both major wings of the British Neoliberal Party are deeply concerned at the possibility of unguarded custodians like Serco or G4S making one of their occasional minor errors in a privatised prison and handing some future election to the lesser-paying candidate. And burble upon the world stage. And whose fault the whole thing has been. When faced with so simple a sight? And poor folk, and cripples, and wogs. If we look away from their race. Because he's been good to the gays. He's covered for moguls and banks. And yet so few give him their thanks. And kicking the singular mums. Now he's prey to the swivel-eyed loons. In a marketplace full of baboons. Unlike windfarms or homes for the proles, the average glass-and-concrete corporate phallus elicits no concern from the cheery philistines of the Bullingdon Club, and still less from their Minister for Atomisation and token northerner, the fleshpot of Brentwood and Ongar, Eric Pickles. There are plans to build skyscrapers in Westminster, a golf course next to the Giant's Causeway and a supermarket at Hayle Harbour, a Gove-historically insignificant site in Cornwall. Naturally, there will be jobs and urban regeneration and all the usual benefits which occur when large private companies get their way. Turning the Giant's Causeway into an adjunct of a golf complex could even "put Northern Ireland on the world's sporting map", much as the Olympics has enriched London's East End and motivated thousands of sportsbeings off scrounger benefits. Nevertheless, the wogs at UNESCO are threatening to take Britain's heritage status down a peg or two; which is certainly too bad of them. It was practically the hour of closing at the Gallows and Glockenspiel, and Ten Gallon Harry was trying to wheedle his way out of the latest forfeit imposed on him by Limbless Fred, which involved Mr Boggust and Mr Blodgett and a packet of pork scratchings. Pippa Twelve Toes and Malvolio Quabbage were loitering at the card-players' table, listening to the argument and not helping in the least. "Eighth of June, sixteen hundred and seven," announced Hooligan Motts. "Nearly closing time." The doors opened, admitting noises of affray and a burly specimen of the servant class. He wore a liveried gambeson, padded and pleated in yellow and puce; he wore a chain of office around his neck and a chain of enforcement around his arm; and he wore a facial expression of self-satisfaction that betokened a virtuous pleasure in recent nastiness well executed. "Beer," said the burly specimen succinctly to Hooligan Motts; and Hooligan Motts drew and served him a pint of Hinge and Whortleberry's Nearly Drinkable. The burly specimen drank long and deep and then slammed the pewter mug vigorously down on the bar, while a relatively modest degree of discomfort registered upon his weathered and walloped face. "I trust, fellow," he said to Hooligan Motts, once the last ructions had made their way south of his oesophagus and into roomier territory, "I trust that this is a respectable establishment, with all due fear of God, the king and the law, and that cheese is not served with undue license, to be made illegitimate use of by the upstart peasantry." "We serve what's on the blackboard," said Hooligan Motts. The bill of fare on the blackboard did, in fact, include cheeses of numerous varieties and varying degrees of digestibility; and Hooligan Motts was known to be in possession of several further varieties obtainable only by recognised patrons and only on condition that they were used for non-belligerent purposes. However, the burly specimen glared at the blackboard and saw nothing he cared to recognise; so he glared at Hooligan Motts and took another drink. "I am a servant of the family Tresham of Newton," he said, "whose lordship hereabouts is wise and absolute." "Very convenient all round, I'm sure," said Hooligan Motts. "A most delicate business," the burly specimen said; "particularly where cheese is involved." "Not that I have any objection to cheese in its proper place," the burly specimen said; "but when 'tis made to stand in the way of progress and enterprise, when the peasantry are roused against the legal enclosure of uncultivated ground, when the king's own laws are subject to open defiance," the burly specimen drained the pewter mug and gazed about him with stern aspect, "then, sir, we must look to our cheese and beware." "Aye, sirrah, cheese," the burly specimen said, as Hooligan Motts refilled the pewter mug. "The peasantry of which I speak were roused by a Captain Pouch, so called because he carried with him a pouch containing a secret piece of prophetic cheese, which he claimed would bring the Lord's protection upon himself and the seditious rabble which he led." "And did it?" asked Malvolio Quabbage. "Who can say?" the burly specimen replied. "Despite the king's proclamation for sharp remedies, the militia refused to put down the rising, which meant that the servants of the local gentry were forced into battle with the mob. 'Tis true that we managed to subdue the revolt and kill between forty and fifty, not all of them women and children; nevertheless, it is hardly labour suited to our station." The burly specimen shook his head, and took another swig of Hinge and Whortleberry's Nearly Drinkable. Malvolio Quabbage just shook his head. "You may shake your head, sir," said the burly specimen, so Malvolio Quabbage shook his head again. "You may shake your head, sir, as much as you please," the burly specimen said rashly; "but the question remains: did this Captain Pouch misunderstand the prophecies of the cheese, or was he deliberately deceived, in order to undermine the king's peace and bring bodily inconvenience to various loyal and hard-working members of the servile community? Was it God's cheese, or the devil's?" "Did anyone think to taste it?" asked Malvolio Quabbage. "Indeed they did not," responded the burly specimen, with umbrage. "If 'twere the devil's cheese, the consequences could be fatal, and if 'twere God's cheese, the eating of it would savour of Popery. It has by now, I trust, been conveyed to some holy place, where persons immune to any malefic influences may decide how to deal with it. In the meantime, we can do little but pray for guidance and for a successful and efficient conclusion to the enclosure of Rockingham Forest." "That'll help," said Malvolio Quabbage. One of the Conservative Party's owners (Rupert seems to have gone quiet for some reason) has had his minions conduct another survey, and has discovered one of Daveybloke's most remarkable achievements; very nearly as remarkable as turning an economic recovery into a three-year depression. Despite the salesmanship skills lovingly massaged into his little pink skull when Daddy got him that long-ago job as a PR junior; despite the long, hard months of cultivating his common-yet-cuddly side between the time when he realised he might have to fight the 2010 election and the time when he failed to win it; despite surrounding himself with a collection of dead-eyed fanatics, blathering gargoyles and Iain Duncan Smith; and despite the foaming baboons, sanctimonious hypocrites and Liberal Democrats which infest his back-benches, Daveybloke has managed the seemingly impossible and made himself less popular than his party. It's an achievement surpassed only by that of Eds Miliballs, who by a Herculean effort have somehow still been able to position themselves as the worse alternative. The greenest government ever, which displays few qualms about letting shale-frackers have their way with the countryside, has come over all localist about wind turbines. Wind turbines, of course, are nasty, noisy, dirty things, quite unlike motorways and nuclear power stations and all the other little goodies which the greenest government ever and its oily little chums in the fossil fuel industry like to bestow upon the public. Accordingly, Daveybloke has decided that "it is very important that local voters are taken into account when it comes to windfarms", if not when it comes to much else. Ed Davey (not to be confused with Ed or Davey), the Deputy Conservative doormat at the Department for Energising Climate Change, insisted that the Government is committed to "appropriately sited onshore wind", much as it remains committed to an appropriately owned national health service, an appropriately equitable distribution of legal aid, and appropriately targeted restrictions on the corporate purchase of ministers. Having no more pressing tasks for the foreseeable future, the London Haystack has decided to give the Gove-Ferguson™ history syllabus a bit of a boost and remedy the chronic shortage of books about Winston Churchill. Of course, biographer and subject have much in common, quite apart from their passionate adoration for the sound of their own respective voices. Churchill, like the London Haystack, was a jumped-up hard-right journalist from a rich family who was not averse to stabbing his chums in the back when expediency seemed to call for it. Unlike Churchill, the London Haystack is not on record as having suffered from depression, and it will no doubt be interesting to some whether he believes the great man should have pulled himself together by getting more money off the taxpayer or by getting himself off with a Petronella, or perhaps even both. The London Haystack intends his opus as a rebuttal of "Marxist historians who think history is the story of vast and impersonal economic forces"; it is as yet unclear how the market theologians in the British Neoliberal Party's three right wings will react to being tarred with the M-brush, but they will doubtless be reassured by the story's moral, which the biographer has been kind enough to release in advance. "The point ... is that one man can make all the difference" and win Britain's most uncontroversially jolly war, despite the miserly contributions of the USSR, the English-speaking peoples and their subject races. The greenest government ever has narrowly averted defeat in a Commons vote which would have imposed a target to decarbonise electricity generation by 2030. Although many businesses approve of the idea, thanks no doubt to their outmoded expectations that governments should provide leadership rather than salesmanship, the Osborne economic miracle cannot be put on hold simply in order to accommodate sandal-wearing socialists like Tim Yeo. Some Conservatives, and even a few Deputy Conservatives, did vote for the measure; other potential rebels were bought off with "a promise by the coalition to allow the secretary of state to consider a 2030 decarbonisation target in 2016." Well, those potential rebels certainly did drive a hard bargain. Given its origins in illegal immigration and terrorism, it is perhaps understandable that the Righteous State should be concerned over the recent influx of Africans who threaten to dilute the purity of the race. There have been about sixty thousand in the past eight years, mostly from Eritrea or Sudan and mostly falling into the British Home Office categories of scroungers ("fleeing repressive regimes") and job-stealers ("looking for work"). The Righteous State has responded by building another Fence of Friendship, this one along the Egyptian border; and last year it offered some of the migrants money in return for leaving voluntarily. Now another scheme has emerged; this one involving deportation to an unnamed third country. It is as yet unclear whether the people so deported will remain migrants, or whether they will thereby gain the more honourable title of settlers. Well, here's a thing: the weather, the last Labour government and the perfidious Euro-wogs are not the only factors which have been holding our economy back. Another difficulty is that there are not enough female chief executives in the FTSE 100; not enough girls are being brought up to be like Maria Miller. Miller, who famously thought that four hundred thousand jobs would be quite adequate for two and a half million people if only the latter looked hard enough, and whose most recent contribution to the present renaissance is a lecture urging artistic types to help her with the price-tags, has now decided that women are essential to a strong economy. Miller is producing a nice, cheap booklet for parents about how to shove the next generation of daughters through the glass ceiling; unfortunately, the present crop of mature females is a bit shopworn from having been a price worth paying for the Osborne economic miracle. It was nearly closing time at the Gallows and Glockenspiel when a small, middle-aged king strode in. He was followed by three more kings who stumped, shuffled and slouched, and who were rather younger than the first king and even more diminutive. The small, middle-aged king marched regally up to the bar, and snapped his little fingers with noble insouciance at the nearest of the smaller and younger kings. The smaller king sighed, like a king with a royal pain somewhere, then delved in his little robes and extracted a silver coin, which the small, middle-aged king plucked from his grasp with princely unconcern and placed before Hooligan Motts. "A large one," he said, "and three small ones." "Relatively speaking," put in Malvolio Quabbage. "That was an order, not a description," snapped the smallest of the three younger kings; and, turning to the barman: "Now hurry it up, for we have business elsewhere." "Come, come," said the small, middle-aged king; "there's no need to speak harshly. Excuse my servants' manners," he told Hooligan Motts, eliciting snorts of discontent from the three younger kings; "but this is a very special day for us all." "First of June, nine seventy-three," agreed Hooligan Motts. "Nearly closing time." "Precisely," said the small, middle-aged king; "and we must take our refreshment and be away fairly quickly, for there is much to do." "Much for us to do, he means," muttered the largest of the three younger kings, as they all clambered up onto bar-stools, Pippa Twelve Toes giving the smallest king a leg-up; and Hooligan Motts served four measures of Crumley's New Style mead and turpentine, one large and three relatively small. The small, middle-aged king picked up his drink and held it aloft. After a moment and a few nudges, the younger kings all did the same, amid much muttering and mumbling and rolling of eyes. "To the long, happy and holy reign of Edgar the Peaceable," said the small, middle-aged king in loud yet reverent tones; and the three younger kings rolled their eyes and repeated the toast in mutters and mumbles that were more subdued and possibly nearly as reverent, though Granny Forbus compromised the matter by blowing them all a raspberry. "Are you all friends of Edgar the Peaceable, then?" inquired Pippa Twelve Toes of the smallest king. The smallest king looked sideways at the small, middle-aged king and, seeing that his back was turned, pointed at him with a little finger and very little respect. "That is Edgar the Peaceable," he said, "and we are all his vassals, come to pledge him our fealty on the day of his coronation." "Oh, that's nice," said Pippa Twelve Toes, who preferred royal weddings but would settle for a coronation if there was nothing else going. "That," said the smallest king, pointing the same disrespectful digit at the second-smallest king, "is Máel Coluim of Strathclyde, and that," he pointed at the largest of the three younger kings, "is Cináed an Fionnghalach of Alba, known to his friends as the Fratricide, or as Kenneth to those with no particular urge to long life; and I myself am Maccus mac Arailt, king of many islands; and here we are all three, forced to submit ourselves to that wife-stealing bandit Edgar, just because he is more peaceable than we are." "Oh, he's peaceable all right," muttered Máel Coluim of Strathclyde. "He's very peaceable indeed," mumbled Cináed an Fionnghalach of Alba. "Well, if you don't like being his vassals, why don't you all join forces against him?" asked Pippa Twelve Toes. "He can't be terribly strong, not if he's just come to the throne and if he's as peaceable as you say." "Those two will never join forces," said the smallest king. "Cináed an Fionnghalach has raided Strathclyde on various occasions, and plundered Northumbria as well, so Máel Coluim resents him like a brother, even though they both hate Edgar like a father. And Edgar has been on the throne a full fourteen years, during which he killed Earl Aethelwold of Wherwell and married his widow, among other peaceable actions." "Oh," said Pippa Twelve Toes, who thought it possible that even a royal wedding ought not to come at any price. "Well, come along, you three," said the small, middle-aged king, draining his Crumley's New Style mead and turpentine and descending from his stool almost entirely deliberately; "we haven't got all day, you know. Never let it be said that transportation in my kingdom is in any way unreliable." "We have to row him to church," said the smallest king tragically to Pippa Twelve Toes; "row him in a boat, like wherry-men skiffing on the bale-barges. And the chroniclers will record it all. A thousand years will not wipe out the shame of it." "Now, don't you worry," said the small, middle-aged king, who had caught the last few words. "The chroniclers need not record everything; you can always stop for a breather here and there, and posterity none the wiser. The business will be given a bit of colour, naturally; among other things, I've ordered the chroniclers to write that there are eight of you, but without necessarily naming the five whose presences will be less factually corporeal. But each of you three will be mentioned, I guarantee. Row me well, and your names will be remembered as long as the name of Englaland endures." He strode regally out, followed by the three younger kings and the bilious gaze of Granny Forbus. "Good of him to have our shame preserved for the ages," grumbled Cináed an Fionnghalach of Alba. "As long as the name of Englaland endures," mumbled Máel Coluim of Strathclyde. "Thinks he can do as he pleases, just because he's so peaceable," muttered Maccus mac Arailt, king of many islands. "If he weren't so bloody peaceable, I'd show him."